There is a finite probability that an ion (after photoionization) will be left in a specific excited energy state a few eV above the ground state through excitation of the ion by the outgoing photoelectron. When this happens, the kinetic energy of the emitted photoelectron is reduced and this will be seen as a “shake-up” peak at a higher binding energy than the main line. Shake up lines are common with paramagnetic states. 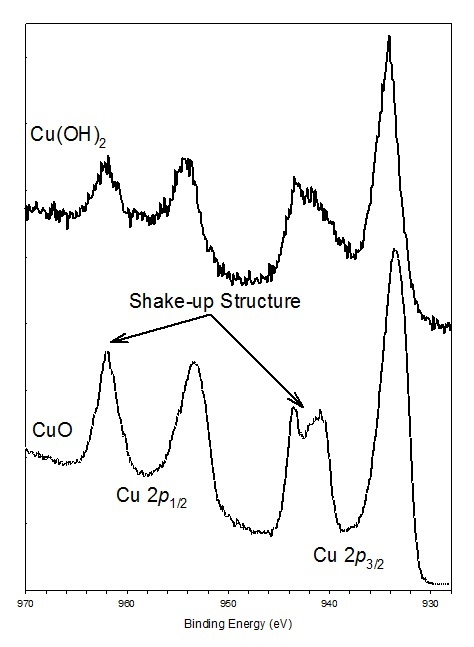 The classic example of shake-up structure is seen in the 2p3/2 spectrum for Cu(II) species such as that for Cu(OH)2 and CuO seen in Figure 1. The shake-up seen for transition metals can also be described as a strong configuration interaction in the final state involving significant ligand-metal charge transfer that results in an extra 3d or 4f electron compared to the initial state. In this case of CuO there is a shake-up of a 3d electron leading to a 2p53d9 configuration. The strength and shape of the shake-up features can aid in the assignment of chemical states. This can be seen in Figure 1 where the two Cu(II) species show different shake-up structures. Shake-up structures will also be important in the analysis of Mn, Fe, Co and Ni species. Figure 1. 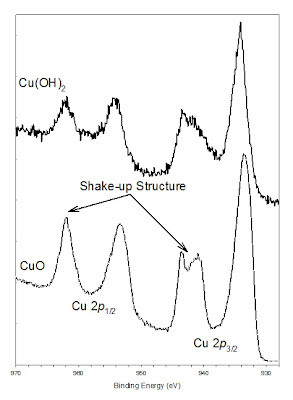 Shake-up structure in Cu 2p spectra of copper (II) hydroxide (Cu(OH)2, top) and copper (II) oxide (CuO, bottom). F. de Groot, A. Kotani “Core Level Spectroscopy of Solids” CRC Press, Boca Raton, 2008, p 147.